Remember That Pot of Gold? Happy Friday, y’all! 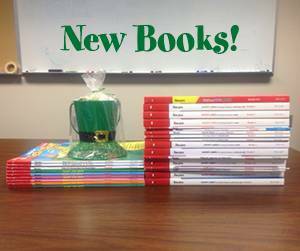 Or should I say “Hooray, it’s Friday?” Either way, check out the pot of gold and stacks of new books from The Mailbox! I smile every time I look at them. You could win that little pot of gold and your choice of a brand-new book from The Mailbox. All you need to do is follow this link before midnight tonight—Pot of Gold—and leave a comment. Easy as pie! Oh, and did you kn ow that today is Pi Day? When I heard the news, my senses sharpened and visions of apples, cherries, and key limes danced in my head. Dang it, anyway. I just may need to have my own little pi, make that pie, celebration! As part of my Pi Day celebration I’ve had students create ‘pi’ poems, created a color coded pi day quilt of the first 100 digits of pi, had them find their birthday in the digits of pi and of course we all enjoy individual pies while doing this. My grandmother was a great pie maker. So many kinds that I can not pick a favorite. yummy! yummy! pie for my tummy. True statement. The statement reminds us to point out the positive in a child and always let them know that they have done their best. If we are always pointing out the negative, then negative is all they will remember. when i think of “pie”, i first go to my hubby’s fantastic quiche! when i think of “pi”, my son is whom i think of — he introduced “pi” to us when he was in middle school, and as a math wizard it stuck! Teacher language is a very important teaching tool. It can add to students vocabulary and give them the confidence they need to succeeded. What we say and how we say it affects the classroom environment and can alter a students attitude. I found that talking to students and not at them (telling them what to do constantly) makes students feel like their opinions matter and creates an open learning environment that everyone wants to be a part of. Some of my parents comes to me and ask me different questions such as, “Do you lick your fingers when you turn the pages as you read a book?” or they come in and say, “My child talks just like you.” They parent that asked the question said his son was looking at a book that night and said he was licking his fingers to turn the pages. As teachers our students does really watch every move we make, actions and our speaking. Little eyes and ears do watch and listen where we think the do or not.